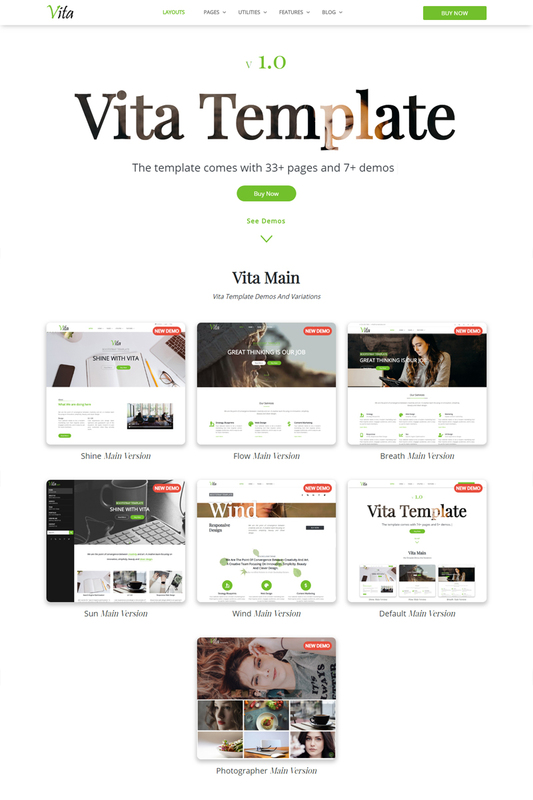 Vita is a clean, beautiful, creative and fully responsive Bootstrap 4 Template for any type of creative professionals, small businesses and freelancers. Vita Creative Bootstrap 4 Template was built using SASS for faster and easier customizations ( .scss files included in the download package ). These demos will be updated with newest variations and designs. New templates will always be added to them. About us, about me, services, faq, contact, team, login, sign up, search results, terms and conditions, blog and other useful pages. Vita is super optimized for mobile devices and have ultimate speed & performance on all devices. 10 navigation, 12 sliders, 5 pagetops, 8 headers and 12 footers. All demos and pages have the ability to convert to right-to-left editions. Please Note : - This item is static HTML5 Template, It’s not a WordPress Theme.